A speech given by Hillary Rodham Clinton just four days after George W. Bush’s second inauguration is never just a speech. On January 24, in an address notable for its elegant Clintonian geometry, Hillary told a room full of family-planning advocates that although she remained wholly committed to the freedom to choose, she also thought it was important for the pro-choice and anti-abortion movements to find common ground. The following day, her address got front-page coverage in the New York Times, and Harold Ickes, with characteristic eloquence, showed up in a Washington, D.C., restaurant to crow about it. So was the former president framing Hillary’s message? I ask. He signals the waitress for the check. “Her speech yesterday was a big speech,” he concludes. “It’s a positioning speech.”For president? Most Democrats agree that Bill Clinton was the best thing to happen to their party in a generation. His wife may now be the best thing to happen to the next. How on earth did this happen? How did the reluctant cookie-baker, the socializer of health care, and the theorizer of a right-wing conspiracy become the presumptive nominee for the party in 2008? What isn’t the question is whether Hillary will run. In Washington, this fact is utterly taken for granted. Rather, the question is, who’ll have the nerve to wrestle the nomination away from her? At the dedication of the Clinton library last November, which the press corps framed as a debutante ball for Hillary, Wesley Clark openly contemplated another run; this January, as I roamed the halls of the Senate, I heard plenty of other names being tossed about, some from the prospective candidates themselves. “Look, I may run against her for the nomination,” said Joseph Biden, the Senate Democrat who’s become a Daily Show favorite for his sense of humor and candor (and who already made a stab at the 1988 primaries, before he was caught plagiarizing from a speech by British Labour Party leader Neil Kinnock). It’s hard to imagine how spectacularly weird a Hillary candidacy would be. It raises the prospect of Bill Clinton, at one point the most humiliated man in America, being back in the White House—but this time, it’d be Hillary in the Oval Office late at night, ordering pizza. It raises the prospect of alternating political dynasties, one composed of husband and wife, the other of father and son. Unlike Bush, though, who never seemed to wrestle with his political eligibility—that’s the marvelous thing about family wealth, how it lends the illusion you’ve earned your privileges—Hillary would be dogged by the same questions that dogged a whole generation of feminists about power and how it’s acquired. Sure, her candidacy would be the ultimate suffragette triumph, but it’d also send a complicated message: So this is how we get to the White House? On a flagstone path laid by our husbands? And what would Bill be, if she won? Co-president? Karl Rove? Just as her husband promised to end welfare as we knew it, Hillary, by definition, would have to end the office of the First Lady as we know it. Unless Bill were content to spend the next four years selecting china patterns. In the meantime, there are the other contenders. Everyone assumes John Kerry is making another stab. (And a brief exchange with him seemed to bear this out: When I asked him how Hillary had become such an attractive option for 2008, he gave me a look that’d tarnish silver, then told me he had a health-care bill to go work on—as if legislating had suddenly become a priority for him for the first time in twenty years.) Ditto for John Edwards. There are the dark-horse governors, like New Mexico’s Bill Richardson, Iowa’s Tom Vilsack, and Virginia’s Mark Warner. And then there’s Senator Evan Bayh, whom some regard as Bill Clinton’s true heir—telegenic, moderate, a former governor. And he comes from the bright-red state of Indiana, currently eleven electoral votes rich. “Yeah, but I don’t know how you beat her for the Democratic nomination,” says Bob Kerrey, the former Democratic senator from Nebraska, now the head of the New School. “She’s a rock star.” She’s also way ahead in the most recent nationwide poll of Democrats, conducted by CNN, Gallup, and USA Today: 40 percent cite her as their first choice in 2008. The whole subject makes Democratic Washington a bit jumpy. How can the party gamble on yet another liberal brainiac who lacks a tactile sense of politics and flair for speaking in the public square? Especially someone as polarizing as she is? Then again, she is Hillary. Think about how much money she could raise. How energized the base would be. And she’d have the world’s best campaign strategist by her side, free of charge. At the core of this debate, of course, is explaining the success of Bill Clinton. Was it his supernatural political gifts? Or was it his centrist politics? Though most Washington Democrats are having this argument now, no one seems to get anywhere with it. It’s not like you can string the two apart. Absent an answer, some very influential Democrats have found their default solution: Pick the other Clinton. And tell everyone she’s just like Bill. “I think the philosophies of Bill and Hillary are close,” says Al From, head of the moderate Democratic Leadership Council, who talks fairly often with Hillary. “She’s not your classic New York Upper West Side liberal by any means,” says Ickes. If you spend any time around Hillary’s fans, supporters, or brain trust, this is more or less the refrain you come away with. And these people aren’t necessarily being disingenuous. Since serving in public office, Hillary has scrupulously positioned herself as a centrist: She sits on the Armed Services Committee; she has spoken out in favor of the death penalty; she voted for the war in Iraq, then voted unambiguously for the $87 billion extra to sustain the troops (and without Kerry’s grammatical sleight of hand—she voted for it before voting for it again). She has always spoken credibly about the role of religion and faith in her life. There are no love beads in sight: She wears the pantsuits, she’s got the coif. And she’s the human equivalent of a Thermos bottle—you have absolutely no clue what the temperature is of the contents roiling within. But are we all supposed to believe this is the whole story? According to the National Journal, Hillary’s voting record has gotten increasingly liberal as her senatorial career has worn on: Though she started in the center of the Democratic pack, she was the twelfth most liberal voter by 2002, and by 2003, she wound up in a three-way tie for eighth. When Al Gore threw a clumsy sop to Miami Cubans (using, of all ghastly things, a child as currency), Hillary couldn’t bring herself to support legislation keeping Elián González in the country. There were the famous moments when the Wellesley feminist—“I’m no Tammy Wynette”—reared her head. And there’s always the health-care debacle. Most Republican senators called it “Hillarycare” before she became one of their colleagues. Of course, many fine politicians contradict or reposition themselves. Bill Clinton did it all the time, and throughout Hillary’s career, one can see traces of Clintonian triangulation, her abortion speech being only the latest example. But what separates good politicians from bad ones isn’t their consistency. It’s whether the electorate notices their pivoting. Can Hillary give the electorate what John Kerry couldn’t—a coherent narrative about herself? A full four years after his presidency, it’s still astounding how much hysteria a Bill Clinton appearance can generate. At Hamilton College in November, just a week after the election, I went to hear him speak, and the scene looked like a Stones concert: hordes lined up outside the door, smoking cigarettes to keep warm; buses from points far-flung; cops and checkpoints galore. The gym was packed to capacity (4,600), and the crowd, composed largely of undergraduates with unsettled skin and ski sweaters, was getting more unruly with every passing minute. The room burst into applause for the random fellow who flipped on the light over the lectern onstage, then groaned when the former president failed to materialize after a few moments. Women began shrieking. Men began stamping their feet. There were several unsuccessful attempts at a wave. When Clinton finally arrived—late, of course—the crowd went nuts. There were howling, metronomic affirmations of his attractiveness (“Yeah, Bubba! Yeah, Bubba!”). But after the thunderous standing ovation, after the yelps and whoops died down, what his audience was left listening to was a rather conciliatory speech. He threw some red meat to the crowd—“every day, the United States of America borrows money from the central banks of China and Japan to cover my tax cut”—but he also gave Bush his due, noting his policies toward Israel have been “pretty good.” He even said the results of the last election were encouraging because so many people showed up to vote. Hillary really is the preeminent Clinton now. Bill’s still in the game, of course, but the dynamic has obviously shifted. She’s the one in the spotlight, looking as good as she ever has, shiny in her prime; he, on the other hand, looks as if he’s suddenly, violently capitulated to age, as if all the libidinal chaos—so central to his ambition, identity, and ultimate public unraveling—has drained right out of him. He still keeps a preposterous schedule (last week, an emerging-issues conference in North Carolina; two weeks before, Davos), but he tires in the afternoon, and he doesn’t quite fill out his suits. Open-heart surgery is kind to no one, not even former presidents. By most accounts, Bill and Hillary speak on the phone every day. They see each other mainly on weekends, though only when their schedules align. They recently attended a Broadway performance of Michael Frayn’s Democracy, where they received a long standing ovation; they attended the Trump wedding reception; he followed her down to Florida three weekends ago while she spoke at a seminar and did a fund-raising loop. People can speculate all they want about their marriage, but it seems safe to say that something other than Chelsea keeps it together. Maybe it’s a shared affection and obsession with politics and policy-making; maybe it’s the fact that their lives are so utterly bizarre that they’re the only ones who can truly relate to each other. But to suggest that their marriage is solely one of political convenience seems to miss something essential about their bond. 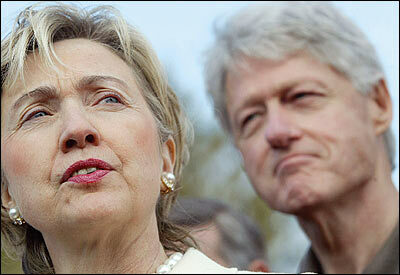 Most people assume that Bill Clinton, because he’s Bill Clinton, still has his grubby mitts in every political pie. And that’s partially true; his political instincts will never desert him. During this last election, Ickes recalls getting frustrated phone calls from Clinton, who’d tell him about ads he’d heard on black radio in Ohio. “They’re talking about gay marriage,” he’d fret. “We have to respond.” (And sure enough, Bush got 16 percent of the black vote in Ohio—an unusually high number for a Republican.) During the DNC race, people went nuts attempting to discern traces of behind-the-scenes machinations: James Carville had lunch with Wesley Clark and asked if he’d be interested in running the DNC—was that the work of the Clintons? But the truth is, there’s only so much politicking Clinton can do, because to do so would erode the majesty of his position. Most of his public talks focus on sweeping themes: How the barons of this century will be the builders of a new energy economy, the way the barons of the last made their fortunes in petroleum. How important it is that everyone have access to clean water. How inescapable we all are from one another in an age of global interdependence. He’s also busy running his foundation—fighting AIDS, encouraging urban renewal. And he’s just accepted a job as the special U.N. envoy to regions devastated by the tsunami. The conversation went perfectly well. Then, six weeks before the book came out, King got another phone call from the Clinton household—this time at six in the morning. “I’m sound asleep,” says King. “My wife answers. And she hears a voice: ‘This is the Capitol Hill operator. Are you ready to talk to Senator Clinton?’ I take the phone, and Hillary says, ‘I’m so sorry to wake you up, Pete, but Bill really had to speak to you.’ ” The next thing the congressman knew, the president was again on the line. “And he says, ‘Hey, Pete! How ya doing?’ ” says King. “No mention that it’s six in the morning. Nothing. And he’s like, ‘Hey, let me read you what I wrote about you, because if it’ll cause you problems, I’ll take it out.’ But of course it wasn’t going to cause me problems. It was basically about how I couldn’t be bought. And he’s like, ‘Isn’t it good? Isn’t it good?’ He was like a kid showing off a new Cadillac. Then, like a day or two later, Hillary called me at 8:30 in the morning. But that was prearranged. Official. Normal. 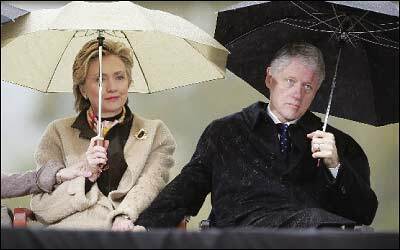 Whatever.”These, perhaps, are the Clintons’ characterological differences in a nutshell: Bill, the bounding cocker spaniel, panting for praise and attention no matter what the hour; Hillary, the groomed Cheshire cat, shrewdly observing boundaries. Dogs often become presidents—Kennedy, Johnson, and Clinton come to mind as recent examples—in part because their desperation to please, their sensitivity to human moods, makes them ravenously hungry for public approval. (And, as we unfortunately know, also a bit prone to acting like dogs.) But can a cat become a president? The problem, he hastens to add, isn’t that Hillary isn’t likable. Quite the contrary. During the Democrats’ Tuesday caucus lunches, he says Hillary used to stun colleagues by popping up for coffee and asking if anyone else wanted a cup—not exactly the reflex they were expecting from a woman who’d just had a giant White House staff at her disposal. But it’s not like the rest of the world knows this. In smaller settings, Hillary has proved she’s capable of charming the most uncharmable sorts. But 99 percent of presidential politics is mediated through the television set, and Hillary’s TV addresses are pure chloroform—they’re positively narcotizing. And senators make lousy candidates. Their speech is larded with facts, figures, mysterious verbs that’d be better off as nouns; because they cast hundreds of votes, they’re an opposition researcher’s dream—nearly all of their votes can be reinterpreted in some unbecoming fashion. Nor does the argument that Hillary has seduced the red parts of New York seem particularly convincing. Chuck Schumer has seduced red New York, too, and no one’s suggesting for even five seconds that he run for president, or that his appeal will translate in Muncie, Indiana. Nor is it clear whether the American electorate will feel comfortable choosing a woman to run a country during a time of war, assuming the world feels as perilous in 2008 as it does now. What if Hillary found her own wedge issue, her own Sister Souljah? I ask Breaux. Would it work? But would it work? What does your gut tell you? Wouldn’t it be ironic if the other politician with the name of Clinton couldn’t triangulate? Graham is perhaps Hillary’s most unlikely fan. In 1998, he was one of the twelve congressmen who managed her husband’s impeachment. Of course, it’s not unusual for senators to build all sorts of bizarre alliances. The rules of the place foster interdependence and compromise; it’s an ecosystem where the donkey really does lie down with the elephant. Yet even by Senate standards, Hillary has demonstrated a stunning flair for bipartisanship. In just four years, she’s managed to co-sponsor a bill with nearly every legislator who, at one time or another, professed to hate her guts. With Tom DeLay—that gerrymanderer of Texas, the House’s very own Ichabod Crane—she collaborated on an initiative concerning foster children. With Don Nickles, the former Oklahoma senator who breezily speculated in 1996 that Hillary would be indicted, she worked on a bill to extend jobless benefits. With Mississippi senator Trent Lott, who wondered aloud whether lightning might strike her before she arrived at the Senate, she worked on legislation to help low-income pregnant women. A Reuters story from April 2003 noted she’d already sponsored bills with more than 36 Republican senators. “A lot of fun! She’s got a great sense of humor.”Can he give an example? I ask what he thinks of Hillary as a presidential contender in ’08. And sure, Hillary’s polarizing, but according to a nationwide Quinnipiac University poll conducted on December 16, George Bush’s negatives are even worse than hers—by six points. According to Opinion Research Associates, a Little Rock polling firm, her approval ratings in the recently red state of Arkansas remained well above 50 percent throughout some of her toughest years in the White House. (In 1998, they were at 65 percent.) In Florida, whose electoral significance need not be explained here, a Quinnipiac poll from December 7 revealed that 45 percent of all respondents wanted to see her run for president—a number that’s ten points ahead of John Kerry, nine points ahead of John Edwards, one point ahead of John McCain (! ), 25 points ahead of Arnold Schwarzenegger (assuming the Constitution were changed on his behalf), and only three points behind Rudolph Giuliani (who couldn’t win the Republican nomination anyway, though he’ll probably be so rich by 2008 that he could finance his own race as an independent). It’s also important to remember: In 1980, Democrats were praying Reagan would run in the Republican primary, believing he was too conservative. They were wrong. In 2000, they were thrilled that a man as seemingly vacuous and inexperienced as George W. Bush was on the ticket. That didn’t work out so well either. I’ll admit it. When I began writing this story, I dismissed Hillary-in-’08 supporters as utterly deranged. I chalked up their enthusiasm as sheer liberal folly—the folly of a party that never learns, the folly of a party that manages to self-immolate quadrennially. But I’ve since come to understand their enthusiasm. You can see how Hillary could thread the needle of the Electoral College, pulling along just enough people to carry Arkansas, Florida, New Mexico. She’s astoundingly disciplined. She knows how to deflect the bad and the ugly. And she’s one of those people who (like her colleague Chuck Schumer) are so hell-bent on getting what they want that it’s hard to imagine them failing. Here’s how one could imagine it playing out: Hillary runs a Senate campaign in 2006 that focuses on how she helped rebuild New York after September 11. The topic, while of local importance, also allows her room to discuss her national-security bona fides, to mention her support for the Iraq war. She stakes out a few positions in opposition to Bush, like Social Security, that New Yorkers would relate to, yet she also stresses her various collaborations with colleagues from across the aisle, subtly suggesting that she’s the true uniter, not a divider. The race gets covered as if it were a national race—this is Hillary, after all. And at some point, the conventional wisdom tips. To a great many people, Hillary remains Eva Perón, Madame Chiang Kai-shek, whoever. But to just enough people, she’s the Eleanor Roosevelt who finally found herself in the right generation—a woman who decided to commit herself to public service and found a life-partner who wanted to do the same. When he’d exhausted all his possibilities, she carried on in the same tradition, and she became the first First Lady ever to hold elected office. It’s a long shot, for sure. Even as I write, I’m not sure I buy it. But one thing I do know: No two people are more adept at writing their own story than the Clintons. “Bill Clinton didn’t just roll out of the crib with this talent,” says Bob Kerrey. “He worked very, very hard at it. He knew the details of every congressional district in America, and he took great care with each one of his speeches—I debated this guy on several occasions, so I can tell you. We’d all be sitting there before the debates, joking around. Not him. He had his head down, his lips moving, rehearsing his answers. Then the camera went on. And he appeared relaxed, sure. But he was prepared. At the dedication of the William J. Clinton Presidential Center, the big joke was how much the library looked like a trailer park, rather than a bridge to the 21st century. But up close, it really doesn’t look like either. Cantilevered over a river, its moorings far off to one end, the building looks more like a gangplank than anything else. The metaphor seems painfully apt. Clinton, the only two-term Democratic president since FDR, can’t seem to shore up his legacy. Everyone who follows in his footsteps keeps taking a header off a narrow walkway. The day was depressingly rich in symbolism and all-too-obvious metaphors. It was pouring—pouring in a wrathful, almost biblical way—and the rain drowned out everyone’s words, once again making it impossible for Democrats to get their message out, and prompting one of my colleagues to note that this day, of all days, should have been the one for Democrats to find themselves a big tent. That evening, the original Clinton team threw a party in the original War Room—a space, it turns out, that’s now vacant. There was something bittersweet about that party. Kerry had just been defeated and the Senate Republican majority had just shot up, yet there were the architects, foot soldiers, and stalwarts of the Last Big Win—Stephanopoulos, Begala, Grunwald—nibbling on spinach dip, trying to figure out what next. A lot of them were passing around photos of their kids, though photos of their younger, ’92 selves lined the wall, as well as pictures of the candidate they served, many of which only a die-hard fan of Bubba could love: Bill playing the saxophone. Bill fans holding up an Elvis poster. Bill flopped out on the sofa, belly hanging out, his head in his wife’s lap, remnants of a ravaged pastry by his side. Hillary looks a lot more presidential in that photo—though maybe they’re just playing their parts, in the end. And they certainly look like partners. Is this the new Camelot? A Wellesley feminist in a headband, a Big Mac addict from a trailer park? Bridges to the presidency have been paved with stranger stuff.